Maine Student Book Award Voting Party! On March 25th, the library hosted a Maine Student Book Award Voting Party for all middle school students who had read at least 3 books from this year's Maine Student Book Award nominees! We had snacks and students got the chance to vote for their favorite book from this year's MSBA list. After voting, students were able to pick a prize out of a big bucket of cookie crumbs! We submitted a total of 24 votes to the statewide Maine Student Book Award committee! We will be announcing the winner soon! About 20 middle school students participated in an event around the book, The Genius Files by Dan Gutman, one of the books nominated this year for the Maine Student Book Award! We played a fun trivia game about the book, and the students had a great time going on a Genius Files-themed scavenger hunt! Enjoy A Blind Date With A Book! 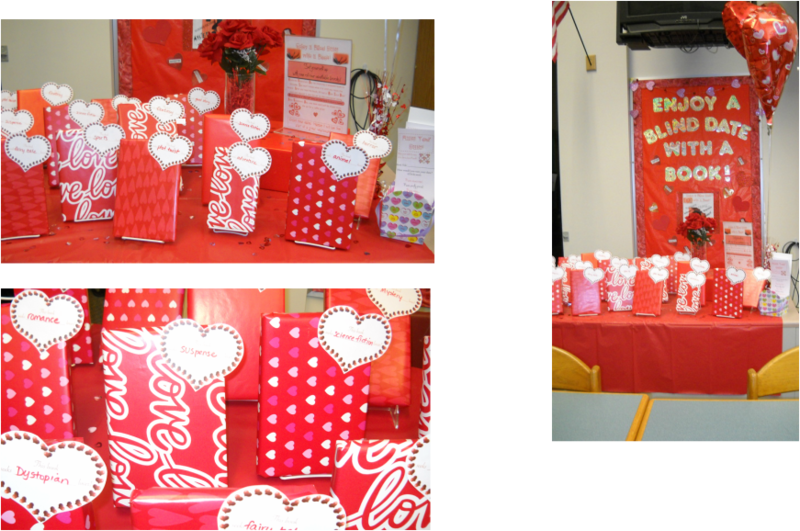 In honor of Valentine's Day, the library invites you to enjoy a "blind date" with a book! Check out one of our specially wrapped books. You won't know what the book is until you leave the library and unwrap it! You must be willing to give the book a try, but if you and your blind date don't work out, you can return it to the library with no awkward questions asked! If you read the book, you can fill out a "Rate Your Date" sheet and drop it in the jar on the circulation desk. At the end of the week after vacation, one lucky winner will be drawn to win a prize! Check out a Blind Date With A Book! It could be the start of a great relationship! 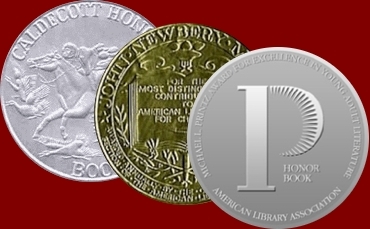 The 2013 Newbery, Caldecott, and Printz Awards! Newbery Winner! Newbery Honor Books! Click here to visit the Newbery page! Caldecott Winner! Caldecott Honor Books! Click here to visit the Caldecott page! Printz Winner! 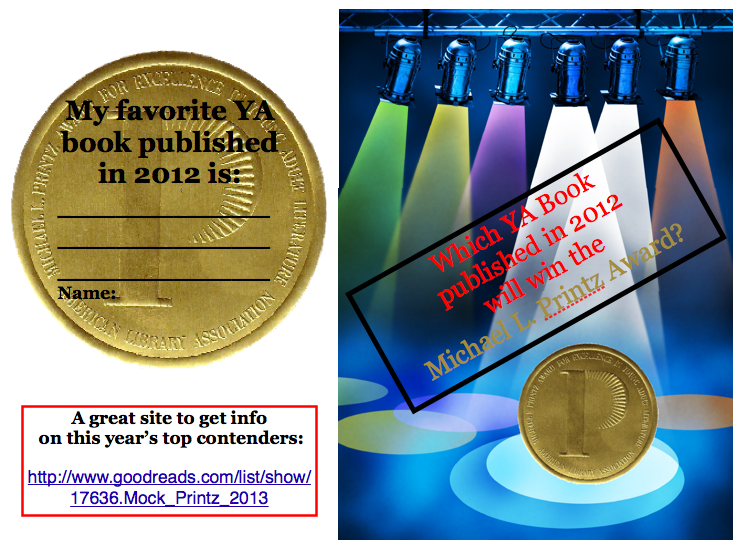 Printz Honor Books! 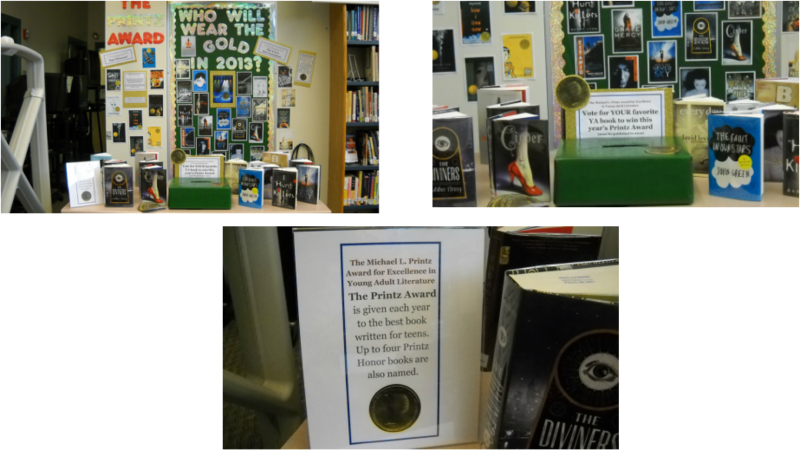 Click here to visit the Printz Award page! Skyping with author, Doug Wilhelm! to be able to meet the author! Author Doug Wilhelm answered lots of excellent questions and gave us some great advice, and our students were a wonderful audience! and it is the new seventh grade read aloud! A big thank you to Mr. Wilhelm for his time and inspiration! Who Will Wear the Gold in 2013? Stop by the library and check out our new bulletin board! It's time for the Michael L. Printz Award, which is an annual award given to a young adult novel based completely on literary merit. Students can check out the bulletin board of this year's top contenders and then fill out a ballot naming the book they think will win! They do not need to have read a book to vote for it. All correct guesses will be put into a raffle to win a prize! We also have a lot of this year's contenders available for check out. Give Thanks for New Books! and we checked out 156 books on that day! Checking out the 2012 Maine Student Book Award Winner at our New Books Celebration! Our Scholastic Book Fair was a great success! The library sponsored a Scholastic Book Fair during the week of Oct. 22-26. The Book Fair was a great success and helped us to get lots of new books for the library! Maine Student Book Award & Tarin Challenge! If the middle school students can read a total of at least 1500 books this year, they will be able to make Mr. Vincent do something really crazy! In past years, he has been duct-taped to a wall and been forced to sport a purple mohawk! What will the middle school make him do this year? For each book the middle school students read, they can fill out a "cookie" and get it signed by a parent or teacher. We will add the cookie to their grade's "cookie jar" displayed in the library. When we have 1500 cookies in the cookie jars, Mr. Vincent (and Mrs. Marston!) better watch out! In addition, the 7th graders are competing AGAINST the 8th graders to see which grade can read the most MAINE STUDENT BOOK AWARD nominated books! 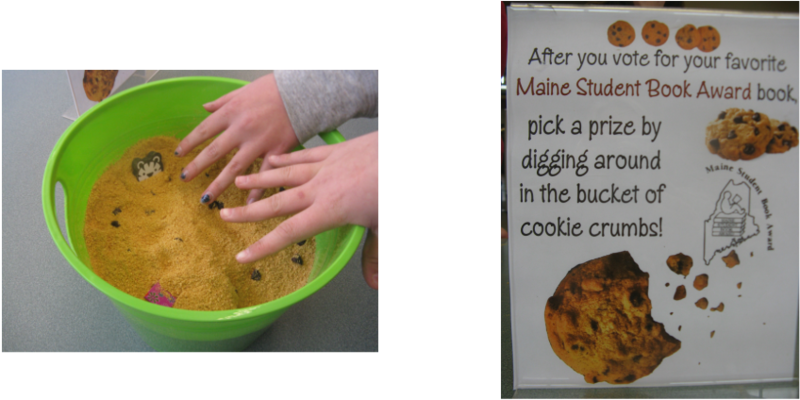 Each time students read a book that is on this year's Maine Student Book Award list, they will fill out a chocolate chip cookie to be added to their grade's cookie jar. The winning grade will receive a prize! At this point, the 7th graders are well in the lead!! Click here to learn more about the Maine Student Book Award! Take the Banned Books Challenge! 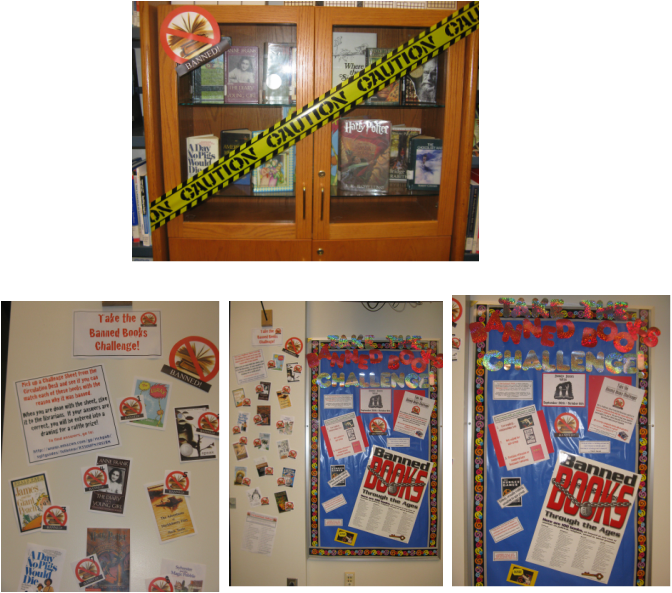 Come to the library to see our Banned Books Display and take the challenge! See if you can match the Banned and Challenged Books with the reasons why they have been banned or challenged! All correct entries will be entered in a drawing for a raffle prize! A book can be challenged or banned if someone feels that it is inappropriate in some way for its intended audience. Just because these books appear on Banned Books lists does not mean that they have been banned or challenged here in Poland! However, they have all been challenged or banned in other schools or public libraries somewhere in this country! Always remember...A banned book is not necessarily a bad book; however, not every book is appropriate for everyone! 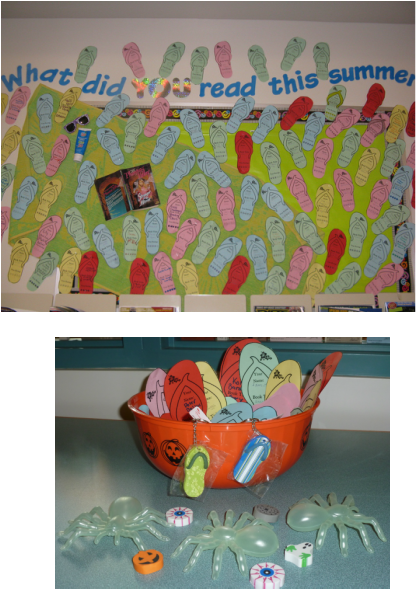 "What Did You Read This Summer" flip flop bulletin board raffle!